Through her work, Barbara came to realize our clutter is generally not about our stuff. Rather it is about the stories and beliefs we hold about our stuff. It’s about our relationship and attachment to our stuff and the fear of what will happen if we let it go. It’s about the ‘mindless blindness’ that keeps us from even noticing the stuff we have. This awareness was brought to clarity when a friend and colleague, Teresa Worthington, invited Barbara to speak to Teresa’s women’s group about clutter and the energy of clutter. Connections between physical and non-physical clutter were revealed that evening through the many stories shared. It was then that Barbara and Teresa decided there was a bigger story to be told to better understand our attachment to our stuff. A story that culminated with their book, Embracing Conscious Simplicity through Awareness, Intention and Understanding. Conscious Simplicity is a way of living and a way of being that creates the physical, emotional, and energetic space that supports the life we want to live. It’s about releasing the inner and outer clutter that gets in the way of the life we want to live. 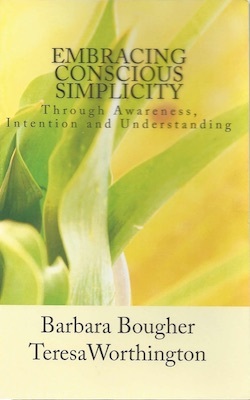 Employing the concepts of Embracing Conscious Simplicity, Barbara enjoys speaking to audiences about how mindsets focused on awareness, intention, and understanding can lead us to a life of conscious simplicity. The concepts are universal to a multitude of situations. Whether we want to organize our closet or our life, nurture our professions or our families, or manage our time or our finances, awareness, intention, and understanding play a role. Simplify and Organize: Mind Over Matter or Matter Over Mind? The authors offer a holistic approach to gaining clarity about what matters most and to creating a simpler life. With a respect for the uniqueness of each individual and an emphasis on empowering the reader, the authors bring together knowledge, tools, insights and true stories that broaden our perspective on the inner and outer clutter that gets in the way of living life fully. Embracing Conscious Simplicity is not about discarding everything we own. It’s about recognizing what we do want and making mindful choices that support a purposeful life.